Did Darwin Fear Priestley’s Fate? When he wasn’t discovering oxygen or trying to confute the philosophy of David Hume or writing a definitive treatise on the history of the study of electricity or helping to found Unitarianism, Joseph Priestley (1733–1804)—one of those dismayingly polymathic figures of the eighteenth century—was supporting the French Revolution. 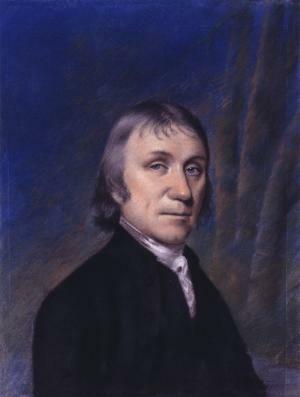 Priestley was in fact so conspicuous a supporter of the revolution that he was among the targets of Edmund Burke’s Reflections on the Revolution in France (1790), although not by name. In July 1791, he suffered for it. Provoked by a dinner held in Birmingham by supporters of the revolution to commemorate the second anniversary of the fall of the Bastille, conservative rioters burned the chapels and houses of the leading Dissenters in the town. “Priestley and his family,” as his admirer Thomas Henry Huxley later wrote, “had to fly for their lives, leaving library, apparatus, papers, and all their possessions, a prey to the flames.” He never returned to Birmingham, but his continued residence in Britain seemed untenable, too. Eventually Priestley and his wife immigrated to the United States in 1794, living in Philadelphia and then in Northumberland County until his death. Priestley appears early in Darwin: Portrait of a Genius, when Johnson is discussing the family background and the intellectual milieu in which Darwin found himself. Priestley moved in the same circles as both of Darwin’s grandfathers, Erasmus Darwin and Josiah Wedgwood: all were regulars in the Lunar Society, a group of Birmingham-area intellectuals in the late eighteenth and early nineteenth century. Johnson writes, “The victimization and enforced exile of Priestley became a defining event in the Darwin family, and among all their dissenting and unorthodox friends, Charles Darwin was vividly conscious of it, more so indeed than his grandfather and father. … The cry of the mob, who were said to have called out ‘No philosophers—Church and King for ever!’ and ‘Burn the atheists!’ always echoed in his subconscious and preyed on his nerves. It gave to his life and work a dimension of worry that had enormous consequences.” (I note in passing that although the first slogan is documented, I was unable to find any source reporting the slogan “Burn the atheists!” in Birmingham.) Well, it may be true that Darwin feared Priestley’s fate. But Johnson provides no evidence for it whatsoever. Darwin Online shows two pages of hits for Priestley, but only one significant hit from Darwin himself. In the Journal of Researches (1845), Darwin is discussing “vitrified, siliceous tubes, which are formed by lightning entering loose sand” (now called fulgurites); by way of example, he adds in a footnote, “Dr. Priestley has described some imperfect siliceous tubes and a melted pebble of quartz, found in digging into the ground, under a tree, where a man had been killed by lightning.” Nor is there any significant interest in Priestley’s fate to be seen in Darwin’s correspondence. Writing to John Collier, a painter who was Thomas Henry Huxley’s son-in-law, in 1882, Darwin mentions Huxley’s essay on Priestley, describing it as “the most splendid essay which I ever read.” Huxley certainly suggested that Priestley “not only cheerfully suffered obloquy from the bigoted and the unthinking, and came within sight of martyrdom,” which might seem slightly to confirm Johnson’s claim. But Huxley is clear that the cause in which Priestley suffered was “that hypothesis respecting the Divine nature which is termed Unitarianism by its friends and Socinianism by its foes”: a theological, not a scientific, principle. It seems, in short, that Johnson was trying too hard to forge a connection between Priestley’s fate and Darwin’s anxiety. (After introducing it, he refers to the theme no fewer than four times in the book, and it is even enshrined in the index as “Darwin, Charles, fear of meeting Priestley’s fate.”) A further example appears early in the book, where a few of the memorable incidents in Darwin’s college days are described. In Cambridge, Johnson writes, Darwin “saw two body snatchers lynched by a mob, a grisly scene that reinforced the ‘Priestley fear’ in his subconscious.” There’s a minor mistake here. When he recounted the story in his autobiography, Darwin concluded, “I forget the issue, except that the two [body-snatchers] were got into the prison before being killed”—so they weren’t, in fact, lynched. Johnson’s saying otherwise suggests that he may not have read the passage carefully. Moreover, consider Darwin’s description of the incident as “almost as horrid a scene, as could have been witnessed during the French Revolution.” He deliberately chose a historical comparison. If the mob violence in Cambridge had reminded Darwin of Priestley’s fate, wouldn’t he have compared it to—oh, I don’t know—Priestley’s fate?